Dr. Ethan Halm, Dr. Sandi Pruitt, Dr. Andrew Laccetti, Dr. Lei Xuan, and Dr. David Gerber found no reason to exclude cancer survivors in advanced stage lung cancer trials. Having previously had cancer did not impact clinical outcomes in advanced lung cancer patients and these patients therefore should be considered for inclusion in clinical trials seeking new therapies, according to the study, appearing in the Journal of the National Cancer Institute. The National Cancer Institute (NCI) estimates that more than 14 million people in the U.S. have a history of cancer. Currently fewer than 5 percent of adults with cancer in the U.S. participate in clinical trials. “Modifying the policy for clinical trial inclusion could lead to faster accrual of patients, higher trial completion rates, and more generalizable trial results that can help a greater number of patients, ultimately leading to better treatments,” said co-author Dr. Ethan Halm, Chief of the William T. and Gay F. Solomon Division of General Internal Medicine, and Chief of the Division of Outcomes and Health Services Research in the Department of Clinical Sciences at UT Southwestern. Dr. Halm is holder of the Walter Family Distinguished Chair in Internal Medicine in Honor of Albert D. Roberts, M.D. The researchers studied 102,929 patients over age 65 who were diagnosed with stage IV lung cancer – the most advanced stage − from 1992 to 2009. Of these patients, 14.7 percent had a history of prior cancer. In the study, about three-quarters of previous cancers (76 percent) were diagnosed at stages I, II or III, and most were diagnosed less than five years prior to the lung cancer diagnosis. Among women, the most common prior cancers were breast, gastrointestinal, and gynecologic. For men, the most common prior cancers were prostate, other genitourinary, and gastrointestinal. Patients with prior cancer had 10 percent better overall survival and 20 percent better lung cancer-specific survival than those with no previous cancer diagnosis. Although the study was not designed to determine why prior cancer was associated with superior survival, the research team hypothesizes that the apparent benefit most likely reflects lead-time bias rather than a biologic advantage. “The clinical and radiographic surveillance related to the prior cancer may result in earlier diagnosis of the stage IV lung cancer. This shift leads to longer documented survival times,” said Dr. Gerber. 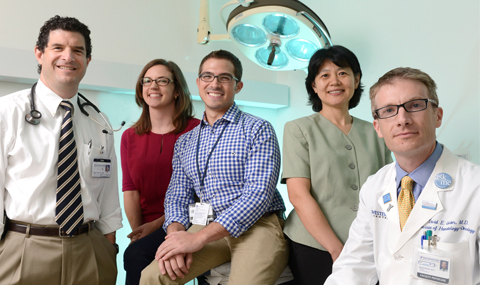 Other UT Southwestern researchers involved include Dr. Sandi Pruitt, Assistant Professor of Clinical Science; Dr. Andrew Laccetti, resident in Department of Internal Medicine; and Lei Xuan, biostatistical consultant in Clinical Sciences. This trial was supported by a National Cancer Institute (NCI) Clinical Investigator Team Leadership Award, the Cancer Prevention Research Institute of Texas (CPRIT), and by the UT Southwestern Center for Patient-Centered Outcomes Research, Agency for Healthcare Research and Quality. Funding was also provided by the National Center for Advancing Translational Sciences, UT Southwestern Center for Translational Medicine.